One of the gifts we didn’t get from the bridal shower was the KitchenAid pasta roller attachment. I was stalking out the registry for this one. I was so obsessed with getting it that on the day of Cassie’s shower, after I checked the registry, I took a ride over to Different Drummers Kitchen and picked it up. It’s been sitting in its box since the shower, and I recently had the idea to research some recipes for homemade fresh pasta. It’s kind of unbelievable how different the recipes you come across can be. 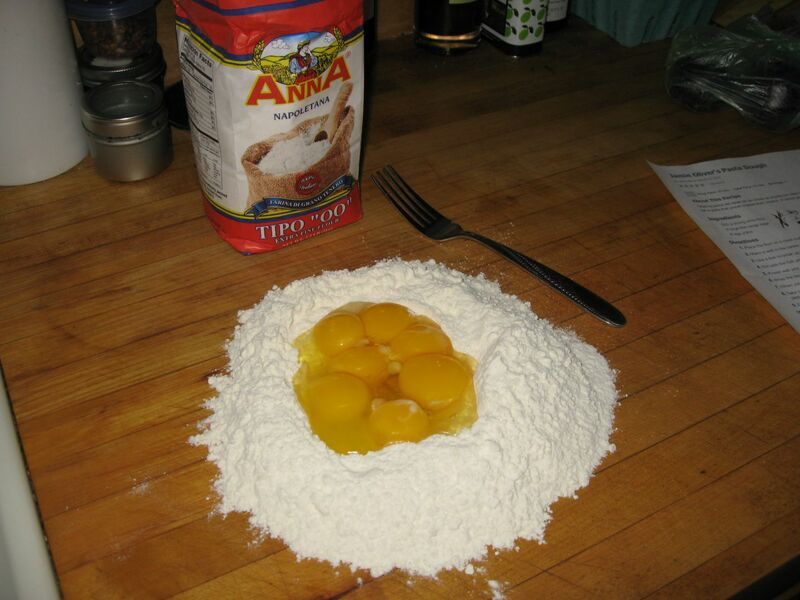 Some use different flours; some use different ratios of eggs; some incorporate salt and olive oil into the dough. The technique is fairly standard, though. I decided to pick a handful of recipes from recognizable personalities, to try making each recipe, and to write about each to help qualify which one I like best. Jamie Oliver’s recipe calls for 320 g of 00 flour (a fine white flour – I found it at Roma Imports in Latham), 2 whole large eggs, and 5 egg yolks. The method I used (which I’ve seen done a thousand times) is to create a well in the pile of flour (like a volcano) and to whisk the eggs with a fork while slowly drawing in flour. 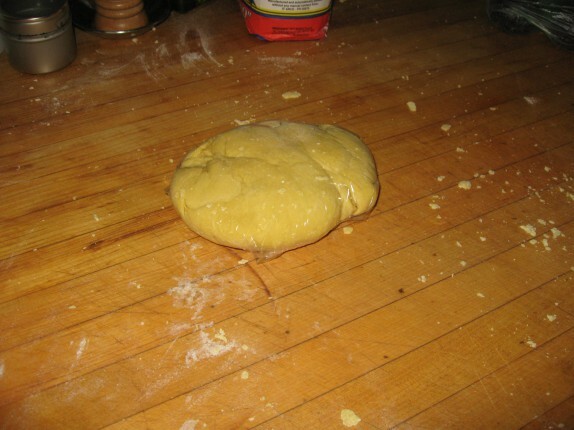 When the fork becomes cumbersome, I switched to kneading the dough with my hands. There was just about no flour left over at the end of a 10 minute knead. 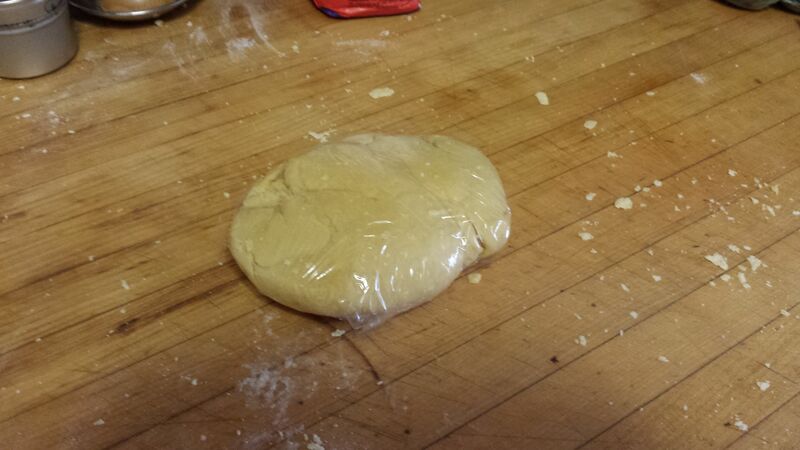 I wrapped the dough in plastic and allowed it to hydrate in the fridge for a few hours before rolling. The pasta roller attachment is pretty easy to use. I divided the dough into four segments and passed it through the roller at the widest setting a bunch of times, folding the dough upon itself as it passed through. This is like a second kneading. You’re really developing the texture of the pasta by doing this. Once it became smooth, I passed it through ascending settings until I reached level 4. That’s what the manual told me I needed to stop at for tagliatelle. 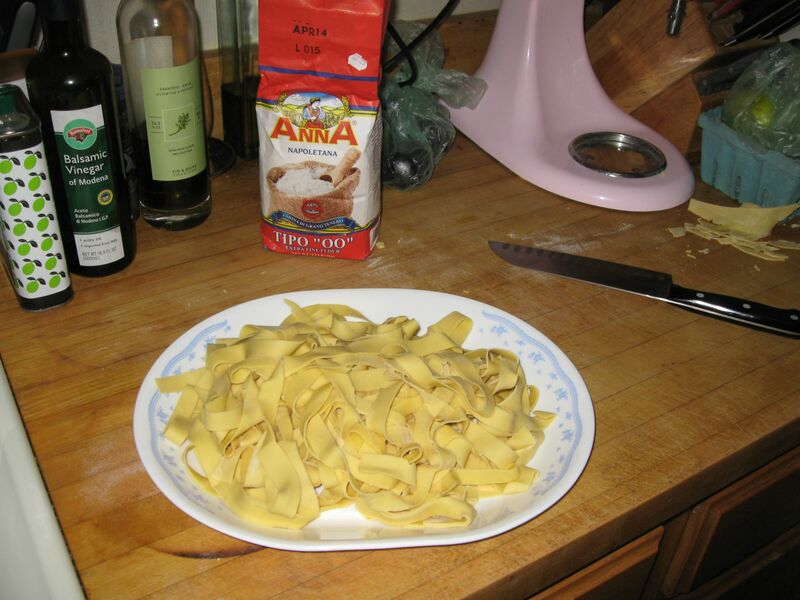 And I just used a knife to cut the pasta into ribbons (that’s what tagliatelle is). 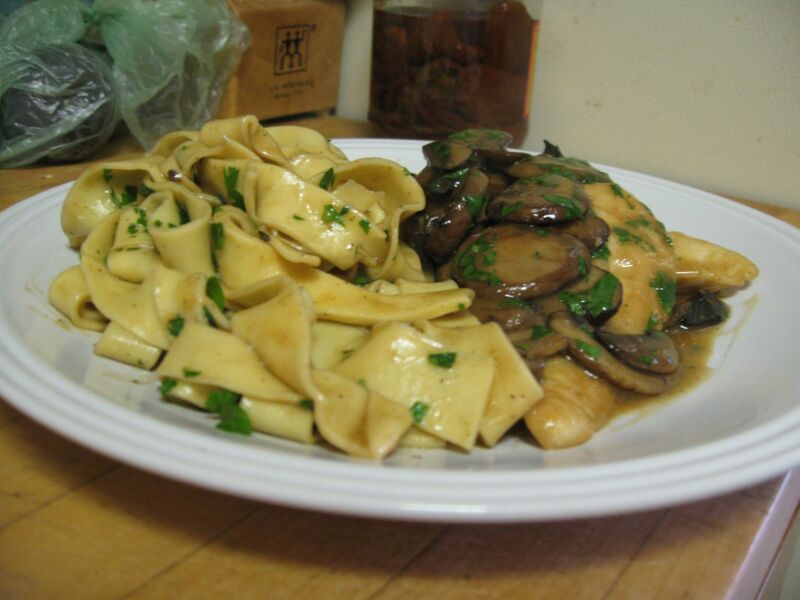 To go with the pasta, I made some chicken marsala. At one point, I had all four burners going! 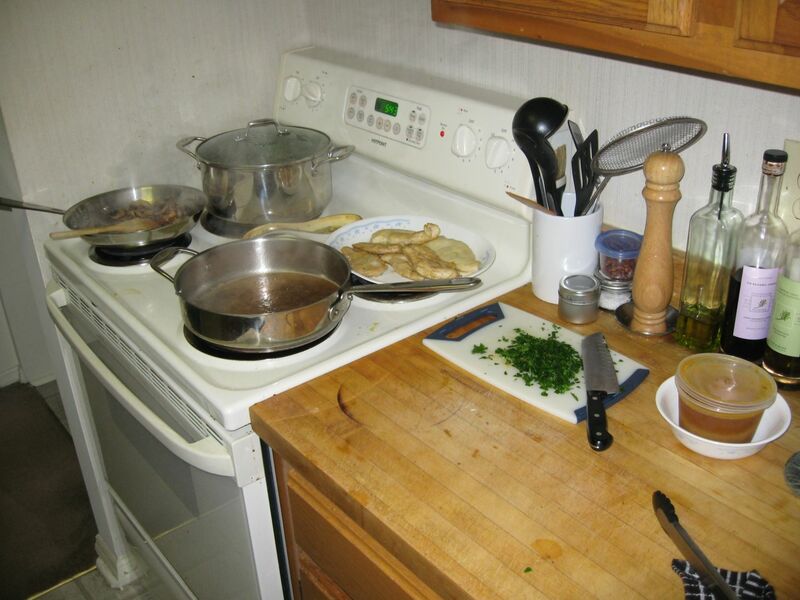 Once the chicken and sauce were done, I dropped the pasta into a large pot of copiously salted water for about a minute. The pasta changes from pale yellow to off white within that time; it also expands (which means I need to cut my tagliatelle a little narrower and maybe roll it to the next setting next time). I drained the pasta directly into a pan with hot marsala sauce, and tossed the pasta in the sauce until it was fully coated. 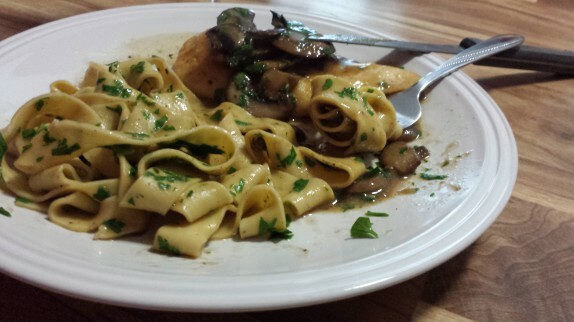 I also tossed a little fresh chopped parsley at the end for some color and flavor. And the pasta was just thin enough to roll on a fork! This pasta came out awesome, and the little bit of work to make it was definitely worth it. It was chewy and rich, but was easy to eat. I’m eager to see how the other recipes compare. The 00 flour seemed to be a little tough to work with and knead, so perhaps a recipe with all-purpose flour will yield similar results with less anguish; maybe it’ll be more difficult to work with. The pasta you made looks great!